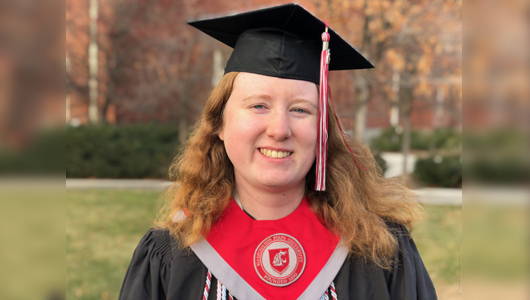 Senior Kayla Rhodes was selected to carry the College of Arts and Sciences gonfalon at the December 2018 commencement ceremony in Pullman. Graduating with a double major in math and computer science, Kayla is a peer tutor for the WSU Math Learning Center and the outgoing president of the Math Club. During the past three years, she has completed internships at the Walt Disney Company, Hewlett Packard (HP), and CDK Global. A WSU Regents Scholar, Kayla also was selected as a Boeing Scholar last spring and worked on developing an automated actuator to move control surfaces of a model in a wind tunnel. Rhodes with the college banner (photo by WSU Dept. of Mathematics & Statistics). “I learned a lot about Boeing and how wind tunnel testing works. I got experience in working with an interdisciplinary team. There was one other computer scientist on my team, but my other two teammates were from different majors,” said Kayla. Her internships at HP, CDK Global, and Disney also offered opportunities to work on real-world problems. At HP’s office in Boise, Idaho, she helped to document an application programming interface (API) with an open source tool called Swagger. While interning at CDK Global’s Seattle office, she and two other interns designed and built an API that displayed information about servers that other team members were using for a range of projects. During her first placement at Disney, Kayla created machine learning models to segment clickstream data from ABC Go, and then joined a team working on apps for the Disney parks where she was able to fix bugs in Disneyland, Walt Disney World, and Hong Kong Disneyland apps. She will return to Disney for a second internship in January to work on another machine learning project for the international company. “I decided to pursue a degree in mathematics and computer science because I like to solve challenging problems,” said Kayla. Rhodes waves the WSU flag in October (photo by K. Rhodes). 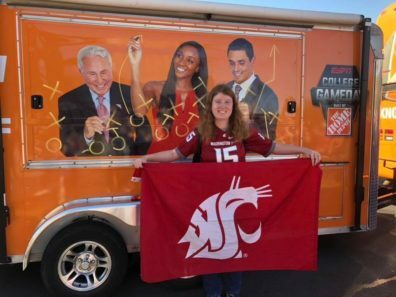 Over the course of her college career, she also volunteered as an Honors College mentor, held multiple leadership roles in the Math Club, worked several years as an undergraduate teaching assistant in the Department of Mathematics and Statistics, and this fall helped welcome College Game Day to campus. Following her spring internship, Kayla hopes to find a full-time job working in machine learning.